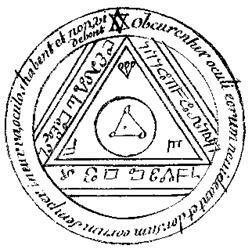 The original manuscript of the Key of Solomon is lost, and only copies of the original script are in circulation. Like the Bible, these copies have been rewritten, retranslated, edited etc. over and over again. The original author of the original manuscript is believed to be the biblical Solomon, the son of King David of the Israelites. For the most part, the Key of Solomon book contains a lot of ‘witchcraft’ spells both affirmative and positive magic spells but also negative magic spells to be used to destroy enemies. Our concern in the context of this article is the so called ‘pentacles’ related to the Sun in the medieval version of the Key of Solomon, the Clavicula Salomonis dated 1572, and regarded as the oldest manuscript. The author of the original script that was used for the translation of the medieval Clavicula Salomonis is believed to be Ptolomy the Grecian. 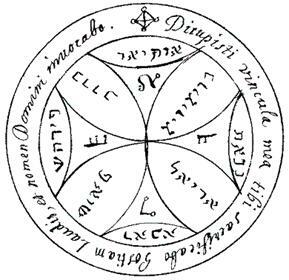 The pentacles in the Key of Solomon manuscripts vary from manuscript to manuscript and the oldest manuscripts dealt only with the planets and their virtues in their astrological context. These are Greek versions of the pentacles. Notice that many of the pentacles contain a four or eight pointed cross. A first glance, the medieval manuscript Clavicula Salomonis reveals a lot of drawings of what seem to be eight-pointed crosses. The ultimate secret is that the key of Solomon is the eight-pointed cross, and this cross represents precession in general and the Great Celestial Conjunction in particular, as we will next demonstrate. The most interesting pentacles are the seven pentacles concerning the Sun. The first pentacle depicts the head of ‘Metatron.’ The versicle that appears on the rim of the pentacles is taken from the bible. 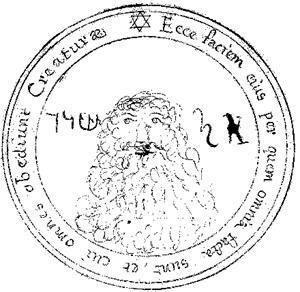 The Latin text translates into 'Behold his face and form by whom all things were made, and whom all creatures obey’ and is written on the rim. It’s important to understand that these texts could not have been part of the original Key of Solomon for the simple reason that the original Key of Solomon is much older than the bible. These texts could therefore be confusing and may have been added by subsequent authors to ‘clarify’ the original manuscript. First pentacle related to the Sun. Second pentacle of the Sun. Notice the eight-pointed cross in the pentacle. Around the rim, the four names of the angels Shemeshiel, Paimoniah, Rekhodiah and Malkhiel are written. The mystical characters on the radii have not been deciphered. We surmise that the four-pointed cross in this pentacle that connects the four angels represents the Galactic Cross. The other cross therefore represents the Earth Cross of the overlapped eight-pointed zodiac crosses. Third pentacle of the Sun. The Hebrew name of God, IHVH (Jehovah), is repeated twelve times in the pentacle and most likely refers to the twelve signs of the zodiac. On top, the eight-pointed cross is depicted again. In addition, the tilted square within the outer square suggests another eight-pointed cross since the diagonals of these two squares form an eight-pointed cross. The Latin inscription on the rim translates into 'My kingdom is an everlasting kingdom, and my dominion endureth from age to age’. The inscription clearly is referencing the precession cycle of the Sun since the Sun moves through all of the twelve signs of the zodiac, and each passage into a new sign is considered a new Age. The Sun’s kingdom is everlasting since after one precession cycle has been completed, another one is started. Fourth pentacle of the Sun. The fourth pentacle of the Sun is very interesting. In the first place, is it showing the eight-pointed cross again, with the cryptic characters at the end of the radii. 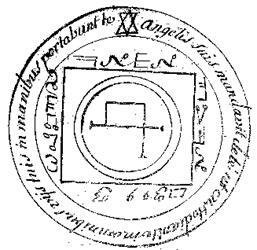 The cryptic characters belong to an occult alphabet developed by Heinrich Cornelius Agrippa in the 16th Century. The name of this alphabet is . . . ‘The Passing of the River’. The name of this alphabet is believed to be referring to the passing of the Jews of the Euphrates, on their return from exile in Babylon, to the Holy Land to rebuild the destroyed Temple of Solomon at the Temple Mount in Jerusalem. The question is ‘why was this strange alphabet chosen and its characters placed at the end of the radii of the eight pointed cross’? The occult message may be that it is not referring to the passing of the river Euphrates by the Jews, but to the passing of the river by the Sun! In a Great Year of a complete precession cycle, the Sun passes that great river in the sky the Milky Way exactly four times, twice at equinoxes and twice at solstices. While Agrippa developed two other occult alphabets, the ‘Passing of the River’ alphabet was chosen for this pentacle because it contains an occult message. Although the Clavicula Salomonis contains many pentacles with eight pointed crosses, the pentacles pertaining to the Sun are the only pentacles that use the alphabet of the ‘Passing of the River’. 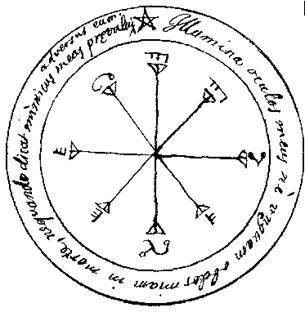 Other mystical alphabets have been used in the pentacles such as the secret alphabet of Malachim for the pentacles pertaining to Mars, which makes the application of the ‘Passing of the River’ conspicuous because it’s being used for the pentacles pertaining to the Sun. The ‘Passing of the River’ alphabet is also used in the fifth and sixth pentacles related to the Sun. These pentacles are more abstract than the previous ones. The letters in the angles of the triangle form the name of Shaddaï. On top the hexagram, the Star of David is depicted. Its significance remains a mystery to the authors. When the two four-pointed crosses merge to form a single for pointed cross (as depicted on top of the pentacle), this is the day and hour of the Sun and it’s moment marks a Great Celestial Conjunction. Like the Second Coming, it seems to represent a moment of redemption at the ‘End of Time’ setting the imprisoned souls free.